Another of my father’s very close ‘book-friend’ was Colonel O.L.J.Milligan. Oliver Leslie James Milligan was born in England, the second son of Major General Leslie James Lamont Milligan . He was in the British Army and as far as I could recall he was educated in Edinburgh, Scotland and at the Royal Military College, Sandhurst. After India got its independence, the family of Colonel Milligan left for England. However, the Colonel chose to stay behind and had his residence in a well-appointed apartment in Esplanade Mansion, overlooking the Raj Bhavan. What a splendid sight of the lawns of the Raj Bhavan from his second floor verandah. In this, he had his library. Oh! What a fine collection of books on British India. Ranging from Military to Mutiny. From Ornithology to Occultism. Colonel Milligan was engaged by a Norwegian Ship making Company, much in the line of Jessop in Calcutta. He was hardly in Calcutta. And when he struck board he was sure to be at Kumars. He would spend hours discussing books with my father. He insisted that my father kept aside books of interest to him and lo behold if any rare books slipped him. He would lament the whole day and admonish my father for passing the book, much in the line of a card player missing a good chance. I remember one such incident. On returning to Calcutta after his stint abroad, he came to learn that he had missed a rare book of W. H. Russell’s The Atlantic Telegraph. London 1866. First Edition. Folio. He was all a grief . The whole day he fretted. He wanted to have a look at the book , even if it meant going over to the person’s house to whom the book had been sold. In the end my father succumbed to his bibliophilic grief and promised to get him a copy by his next return from abroad. Even after the death of my father in 1978, Colonel Milligan was in touch with the second son of Kumar. He was then officiating as the caretaker of St. John’s Church in Calcutta . However with the death of Kumar he lost interest in his collection. Then one day he declared that he wanted to return home. He wanted to carry back all his books which became a herculian task. 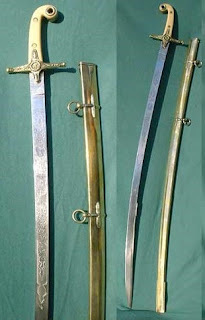 At the time of parting he presented his 1831 British General Officers Ivory Hilted Scimitar to Kumar’s son and sailed back home with his books.